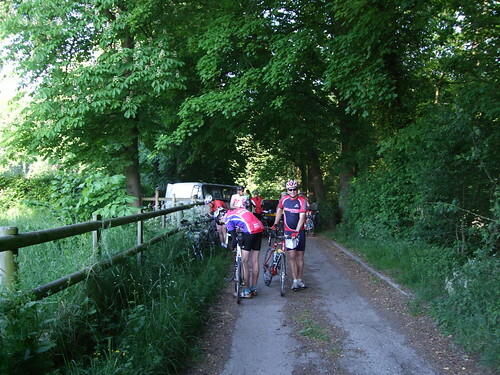 Previously ran as an Audax but now a challenge ride Stans Aquaduct Challenge ride ticks all the Hilly boxes. 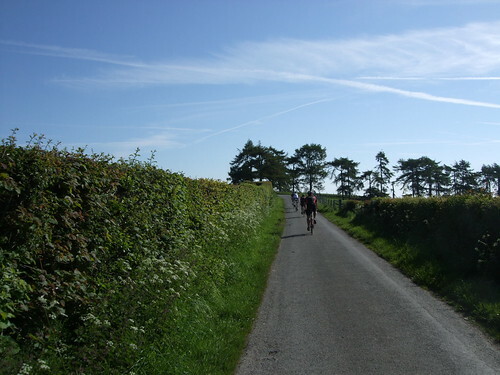 I’d rode this event as an Audax last year along with 30 others last year. 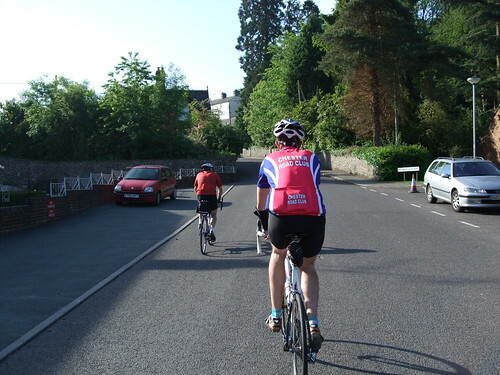 As a challenge ride it had 109 entries from far and wide, the only difference signs and timing to the second on a challenge, a brevet card on an Audax. 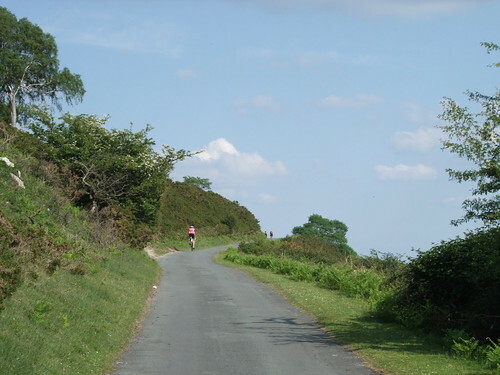 More navigation skills are required on an audax but it’s exactly the same ride. The car park at Trevor slowly filled up as the ride start approached, with it dawning on me that I didn’t know where the start was. I took some other pictures with the Aquaduct in the background but the sunlight made the lane look gloomy. At 8 o’clock Stan sets us off have scanned the bar code on the riding number with his bar code scanner. 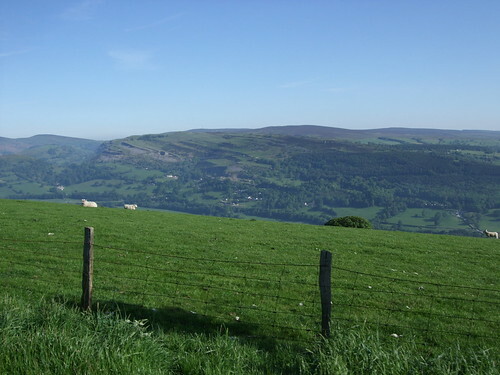 The start is just up the road from the River Dee under the shadow of the Pontcysyllte Aquaduct. Phil from Chester Road Club stuck by me to the end. The first test comes straight after starting, Methodist hill. Marshalled across the A5 and you’d better be in a low gear as it’s straight up. A husband and wife team had to walk near the top as you can see in the picture. 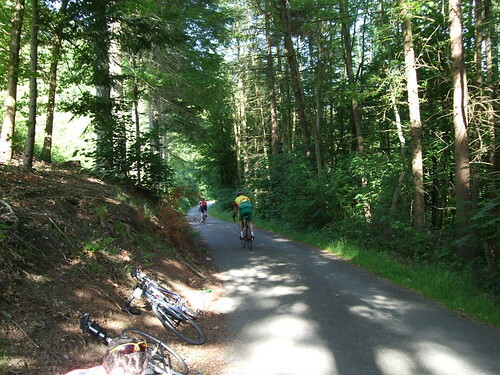 This is the flat bit after the initial climb as it rounds a bend an heads up under the trees on an equally steep ascent. Once out of the trees there is another turn and an ascent but it is a bit more open. Once your up on the ridge you get the benefit of great views on both valleies. The chap above punctured near the descent to Vivod but passed us as I stopped for Phil. 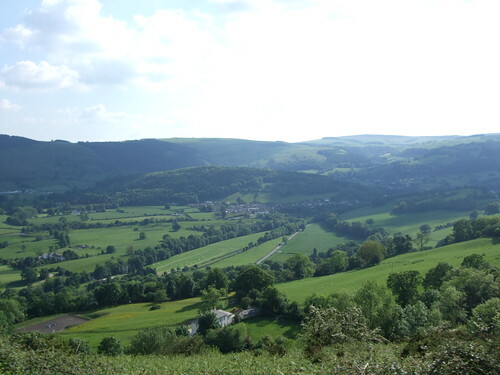 You’re now overlooking the Llangollen Valley at the end of the ride you should be ridding across the other side of it. The above is descending the Nant y Garth pass , the old one. Spectacular views if you have the time. Out of sequence with the later pictures. Road surface bad under the trees. Phil picked up a puncture on the Vivod descent which is steep and rough in places. He was using lightweight tubes and it seemed to be a concussion puncture. A fair bit of the field passed us here but the sunlight through the trees was tricky for a lot of the shots. I don’t profess to be a photographer but I like the above. Someone enjoying their ride. We where probably about 100 metres from the A5. 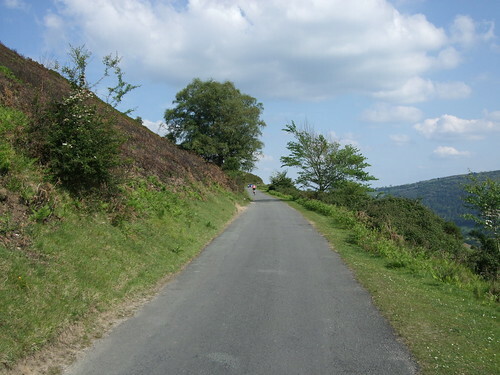 Next up was the Horseshoe Pass with the Old Shoe if you wanted a bit of extra punishment. Got passed by a fair few here so the form is not great. This is the first control and feedstation. 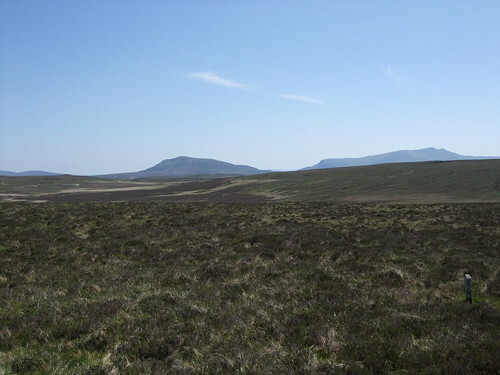 A bit further on from Ruthin and I was asked if this was the Cloecaenog climb which was only paritially true as the first control was at Bontuchel. On the climb from Cloecaenog and the service station the Liverpool Mercury passed us and gave us a wheel which proved to be shortlived. A wheel of this size whould have been welcomed but as it termed out they where not doing the full ride and opted to turn off at the Llyn Brenig junction. 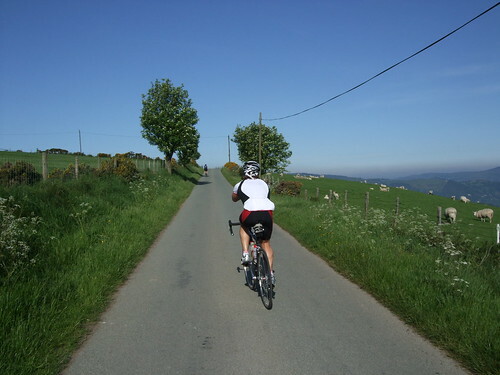 Don’t for one instance think things were easy in the Liverpool Century ride, come the hills they were suffering just as I and Phil where. If not worse. For whatevrer reason they took a different route to a cafe at the junction , even calling back a rider half way up the hill….? Pity as they would have been a good group to latch on to. 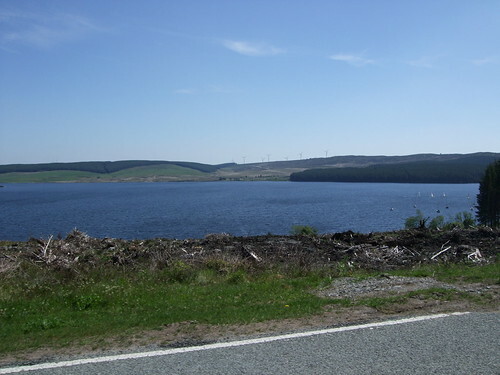 This picture of Llyn Brenig has the windmills in the background, if you’ve rode up the clocaenog valley you’ll have seen them at close hand. A bit further on was a North Wales Police officer with a speed camera waiting to catch speeding bikers on a twisty bit of Snowdonia. Not too many pictures now until the end, after this shot I found that gear and rythem that I like and made up some ground on those ahead. Climbed past the Sportmans and then it was a rollercoaster of a ride with a new Max of 42.1 mph. There was a relentless climb from Yberts Isfan that was also compounded by a lot of holiday traffic including a fair few caravans on a road with passing places. They only seem to turn around and pass us again, it must be those damn satnavs. No sheep problems this year, only problem that this year the cafe was shut due to a water pump problem. This was a bit of a blow but worse was to come, a bit further up the road Phil had another puncture, this time self inflicted as he had managed to kick the valve out of the tube. He had had a rear mech problem but was unlucky this time. 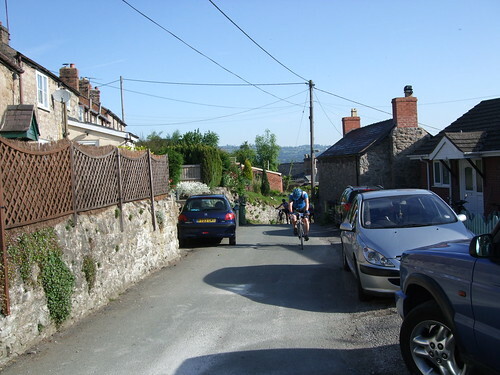 There was another stop on the run to Bala that was welcome, with most of the climbing done it was time to have a bit of fun on the descents and see if you could maintain the momentum up the other side. 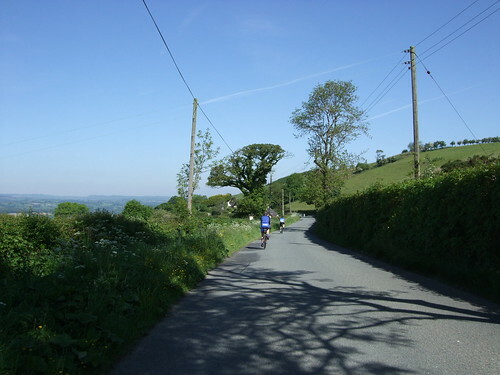 The road out of Bala seemed longer than I remembered it but onve you’ve reached the turn off it’s fairly flat back to Corwen. 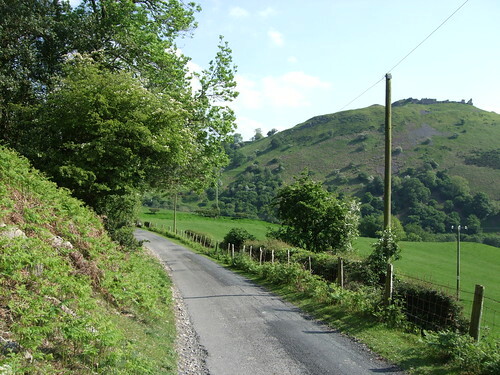 The route takes the Old Coach road back to Llangollen which is by no means flat. We had a run in with a black 4×4 driver on one of the descents with him passing comments to us. I’d had my eye on the time and had thought about a 5 o’clock finish. We also came across a guy on a cheap mountain bike holding a pedal wanting some advice. Past the motor museum we saw the red route to the Panorama, glad I didn’t tackle it in light of what happened next. We crossed the canal to climb up to Panorama Walk. I’d stoped at the bottom of the 12% bit to let traffic past and then had a go at it. I had a good go and then blew up for the first time. This was with the Ventoux to climb in the back of my mind. I stopped had my last gel and started walking, this is a first. I walked up a stretch that was 19% and then got on the bike and rode up to the turn at Panorama walk. It was an expensive walk, £15 for a pair of Keo cleats and 20 odd minutes of precious time. Two guys at the junction were also waiting for a walking rider and a bit further on Phil was waiting for me.The above picture was the view. 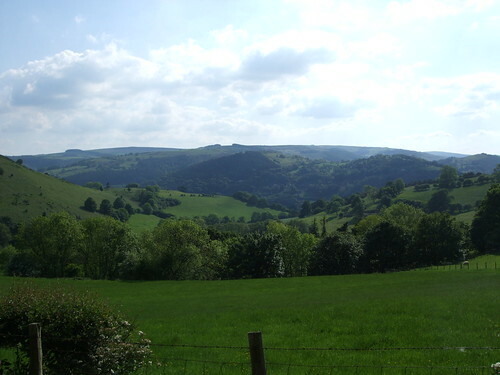 This was taken up by The Panorama near the end of the ride with only a short hill to go. This is it the final climb of the day with Phil in the foreground and two riders just about to go over the top. From then on it was a fast downhill ride to the finish, I found my second wind in knowing it was do-able in under 9 hours 30 minutes. Had a flyer across the bridge and up to the finish. 9hrs 24 minutes 59 seconds. Mistakes, not enough water and too much electrolyte in the bottles. Not enough solids to eat during the ride. Took too many pictures, stopped for Phil twice, granted he stopped for me when I needed it. Factor 50 and Sudocrem won out at the end of the day. Nice tea and a piece of cake for £1 at the end of the ride. Oh forgot to mention Dave Llyod of Mega Challenge and a lot more besides, got lost , had a mechanical or something else failed to finish. A number of Liverpool Mercury Dolan club members turned up on the day and tried to enter on the line – despite my having made it clear that entries were closed and late entries would not be accepted. In addition, you will see that some of them were helmet-less and it is a condition of our event insurance (with cyclosport.org) that riders wear a helmet at all times. 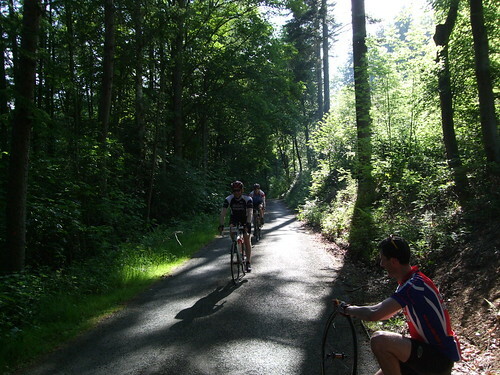 Having been refused entry and told they should not use our feed stops, this group rode the route and turned up at Bontuchel where they were re-directed to Brenig Visitor Centre. This situation was complicated by one of their number having entered (on Friday night) and thus being entitled to use all facilities. A disappointing incident and Liverpool Mercury Dolan club members may be a rarity at my events in future. I should note that two other members of this club entered in good time, rode the event separately, finished well and, I believe, had an enjoyable day out. 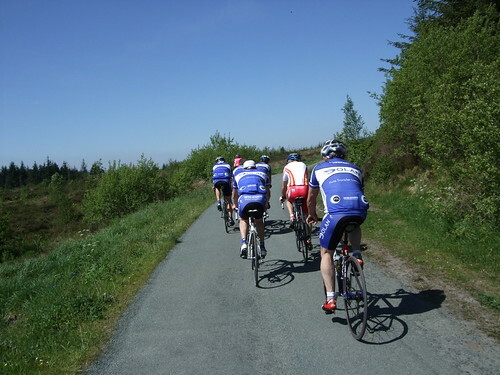 Thanks Stan, Llyn Brenig involved a climb and this was where they turned off. I had mentioned that there was a long way to go only to be met by “Oh no there isn’t” so that explains it. Aptly enough Dr Hutches column in the comic broaches on the subject this week. Hiya Frank mate, Great pic’s looks like an awesome ride mate, Maybe next year I will be able to do something like this, Well done and keep going with the inspiration. Thanks Gaz,see you’ve got a new bike. You need to work your way up to an event like this but your doing the right thing by doing Manchester to Blackpool. Probably took me 4-5 years to get from Manchester-Liverpool charity rides to where I am now. You will always relish your first 100 mile ride, I did. 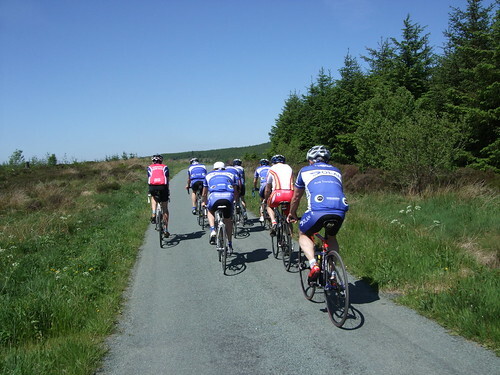 Hi Gaz, you might be up for 100 flatish miles but they were 100 hilly miles on Sunday(very hilly). I’ve got a picture somewhere of the Manchester-Liverpool finish. Don’t fret as long as your enjoying yourself why worry where your at. 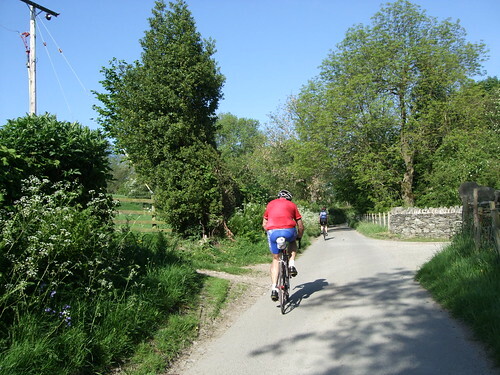 Looks like a good ride – one for me to consider for next year now I’m getting fit enough to manage 100 milers again. Any recommendations for good long(ish) rides for August/September/October to keep the miles/fitness up after I’ve done LEJOG in July? Hope all is well, Just wondered where you go your Discovery Shorts from, I have wanted some since the first day I started to cycle, the problem being before I was wayyyyy too big, Now im wearing Lycra I’m struggling to find them. Gaz it depends on your waist size. Large is 34 inches. XL is 36 inches with 2xxl about 38 inches. Do searches on Ebay for Discovery Channel, it is out there. There are a lot of copies out there now from the far east. You want bibshorts not just plain shorts. I Lycra ones im in now are 38″, Not sure about bib shorts though, whats the advantage ? Gaz, bibshorts don’t cut into you, with less spare tyre effect. They also stop the possibility of getting caught on the seat nose when your going back into the saddle.